Nike describe the Vapor Flash Jacket as their "premium running jacket" for winter. It&apos;s designed for runners who train in low light conditions, at night or in early morning. The Vapor Flash Jacket is reversible. It has a reflective laminated side for 360-degree visibility and a sleek black side for times when visibility is less important. To provide protection from harsh weather, there is an adjustable hood with a built-in visor. This innovative jacket features motion sleeves ensuring no restriction of movement. Nike describe this as "the pinnacle jacket for the stylish runner". 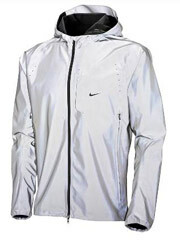 The Nike Element Shield Max Jacket is highly functional and is ideal for runners training in icy cold conditions. For added comfort and protection, this jacket comes with an easily adjustable running-specific hood and hand warmers. This jacket has been designed to keep the wind and rain out while allowing sweat vapors to escape, making it a superb choice for runners who are looking for a full-zip jacket that provides lightweight coverage against the elements. The Dri-FIT jersey fabric helps runners stay dry and comfortable while being soft against the skin and discreet pockets allow for storing of keys, gloves and MP3 players.